(3) they may not have the time. Nothing beats the taste and the nutritional value of fresh home-made pasta. Of course there’s also the small fact that your yummy plate of homemade spaghetti, ravioli, fettuccine, linguini, lasagnette, trenette, tagliatelle or any other form of pasta is just a pasta maker away! So what makes a good pasta maker? How do you choose the right pasta maker for your home kitchen? 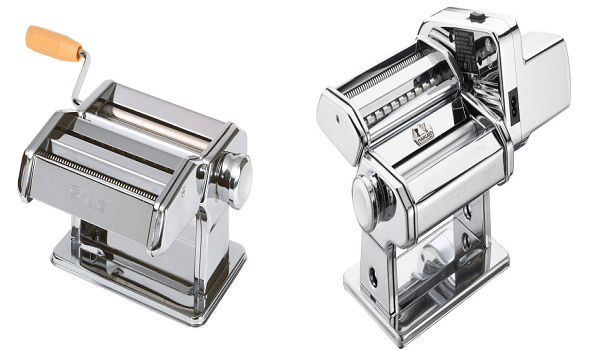 Types of Pasta Makers Pasta makers generally come in two basic types; manual and electric. However, as any cooking enthusiast who’s ever tried making their own past from home or any pasta connoisseur will tell you, the manual type is more preferred. Then there are those pasta makers that combine both manual and electric operation such as the Marcato Atlas Wellness 150. A common feature for all these pasta makers is the clamp used to hold them firm to table tops or kitchen counter tops. These pasta makers are the most common and they are also available in many variations; that is in terms of brand, size, functionalities, performance, and price. The main reason why many people enjoy and love using these manual pasta makers is because they give you the opportunity go all savage on the dough… you know, digging into the dough with your fingers when kneading and it also gives you the perfect excuse to get all dirty while having mad fun in the kitchen. The rollers and cutters are manually driven using a turning arm (hand -crank), and this is done both when flattening (rolling…) the dough to the preferred thickness and when slicing the dough into pasta strips. Some manual pasta makers such as the Ovente PA515 give you 7 thickness settings for fettuccine and spaghetti and they also have an optional attachment that allows you to produce fine lasgnette. Electric Pasta Makers The main difference between manual pasta makers and these electric pasta makers is the motor that drives the rollers. Electric pasta machines automatically draw the dough through the rollers and the cutters which leaves you free to handle the dough with both hands when guiding it through. 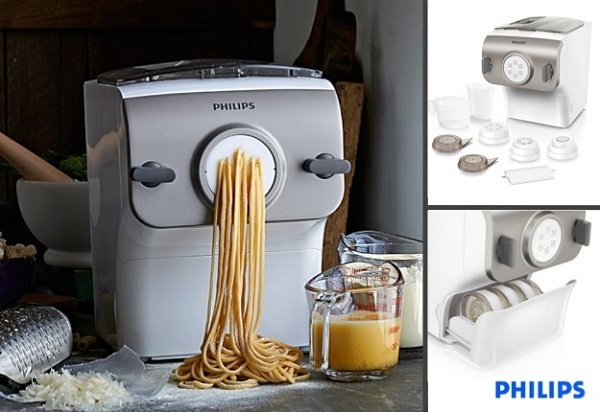 Some of them like the Phillips pasta maker have an automatic mixer which mixes and kneads the dough for you and an extruder to push out the dough in thin strands of spaghetti or several other shapes of pasta. They basically do everything for you and they are ideal for beginners and those without the time or the desire to go through the manual process. This type of pasta maker comes with both manual and electric functionalities. A good example is the Marcato Atlas 150 Wellness with Motor. This pasta maker has the option to operate manually or you can buy an electric powered motor on the side to run the rollers and cutters. Choosing an electric maker is not an easy thing to do. Partly it’s because they come in so many cool looking shapes and they’re loaded with countless useful features. Well, some extra features may not be that useful at all but they add on to the pasta maker’s uniqueness and overall appearance. It all depends on what you’re looking for. The first thing to consider is whether you want an electric pasta maker or a manual one. Manual pasta makers are more popular with pros that’ve done the pasta making thing for a while. Electric pasta makers on the other hand are good for both experts and beginners alike because they do most of the rolling and cutting work for you with minimal intervention or effort. Roller or Cutter Feed Width: The other thing to watch out for is the width of the roller feed. This determines how much pasta you can roll and cut at once. The wider the feed, the more the batches of pasta you can produce in a short time. Size is important when considering how much kitchen counter -top or tabletop space you have. The weight is all about how easy you can carry the pasta maker around especially when cleaning it or moving it between storage and out for use. It’s all literally about what works best for you here. Most electric pasta makers only have the rolling and cutting functions. However, automatic pasta makers come with the mixing and kneading feature which is quite helpful to beginners and those experts who just want to save time or just be lazy as they prepare their favorite fresh pasta. Automatic electric pasta makers do everything for you with some doing the mixing, kneading and extrusion is one swift operation. Another thing to consider when shopping for an ideal pasta maker is the availability of accessories. The accessories determine how versatile your pasta maker is. While some pasta makers are primarily designed to prepare 2 -3 kinds of pastas only, a few of them like the Viante CUC-25PM Electric Pasta Maker come with 9 interchangeable discs that expand your pasta creation to unmatched levels. And yet other pasta makers do more than produce pasta in that they can be used to prepare biscuit dough, bagels or sausages. The build and construction of a pasta maker determines such factors as durability and performance to some extent. You should be careful to pick a pasta maker that is sturdily and compactly built. Preferably, you want a pasta maker that is all stainless steel and less plastic parts or otherwise. This ensures that you get to have your pasta maker around for a longer time without it breaking down. This also ensures that your pasta maker can withstand constant abuse without showing any signs of giving out. The usefulness of some extra features varies from individual to individual and they’re only a matter of preference. For instance, the Phillips electric pasta maker has a small compartment (drawer) where you can store all your pasta shaping plates (discs) to help you have everything together and easily within reach. Affordability is also another important thing to consider on a pasta maker. Although you shouldn’t over -stretch your budget to buy a pasta maker, this is also entirely up to you or your purchasing power. It’s all about how much you’re willing to part with to get the pasta maker you want or need. Please note that expensive doesn’t necessarily translate to good quality and there’re quite a few budget pasta makers out there that would surprise you in terms of performance or reliability. If truth be told… most pasta makers are not easy to clean. Sometimes getting to the nooks and crannies on some of these pasta makers can be a total headache and just a pain to deal with. However, this doesn’t mean that you should throw this ease of cleaning issue to the wind.., there are still pasta makers out there that are relatively easy to clean. Most of them come with cleaning brushes to help things along. How reliable is the pasta maker in terms of performance and producing consistent results? How does the pasta maker perform compared to other competing brands? Your choice of pasta maker should be able to give you the same great results without faltering in performance. While choosing your pasta maker may not be an easy thing to do, it needs not be a stressful hair -pulling or deal either. You can always find what you want if you know where to look. There are pasta makers for all price ranges and different functionalities for everyone. Remember that the features you want may not always be present in one pasta maker or the type of pasta maker at your disposal or that you can afford. However, you should be careful to choose one that has most of the features you’re looking and ensure that you can easily take care of any tasks that require the functionalities of the missing features such as mixing and kneading or shaping your pasta. For instance, when it comes to cutting your pasta to different shapes or sizes, you can buy additional accessories such as pasta stamps or rolling pin cutters. 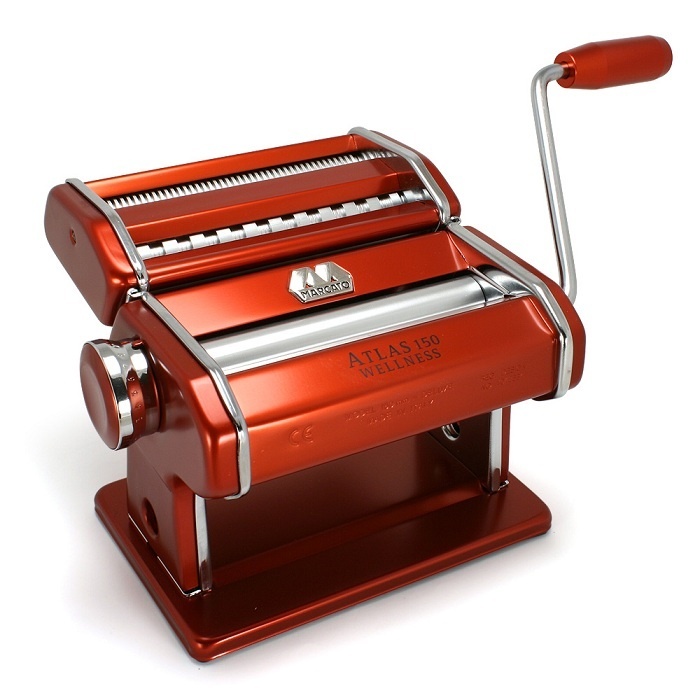 Good luck finding a pasta maker that suits your lifestyle and pasta preparation needs.